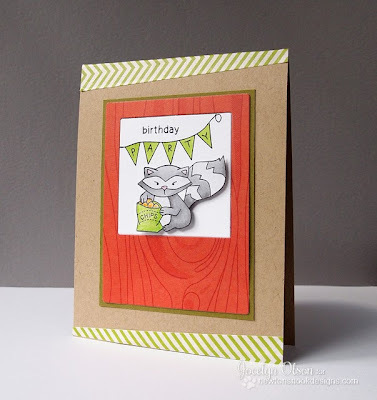 Newton's Nook Designs: Party Time with Jocelyn Olson! This raccoon certainly is! Design Team Member Jocelyn Olson created this awesomely bright and fun birthday party invite using the raccoon eating chips from Campfire Tails stamp set and the banner from Winged Wishes! Don't you think her color combo is fab? Make sure to visit Jocelyn's blog Red Balloon Cards to see a full description of this card and say hello! You still have time - until Midnight tonight - to enter our first Inky Paws Challenge! Do you have a stamp set from Newton's Nook Designs? We hope you'll play along! You have until Friday to play along with our first Inky Paws challenge for a chance to win a prize! If you don't have a stamp set yet, no problem, there is a digital freebie on the challenge page for you to use! We already have over 15 participants so we will be giving away TWO prizes! Will you be a winner? Wonderful card...love how she put the patterned paper on the top and bottom on an angle.